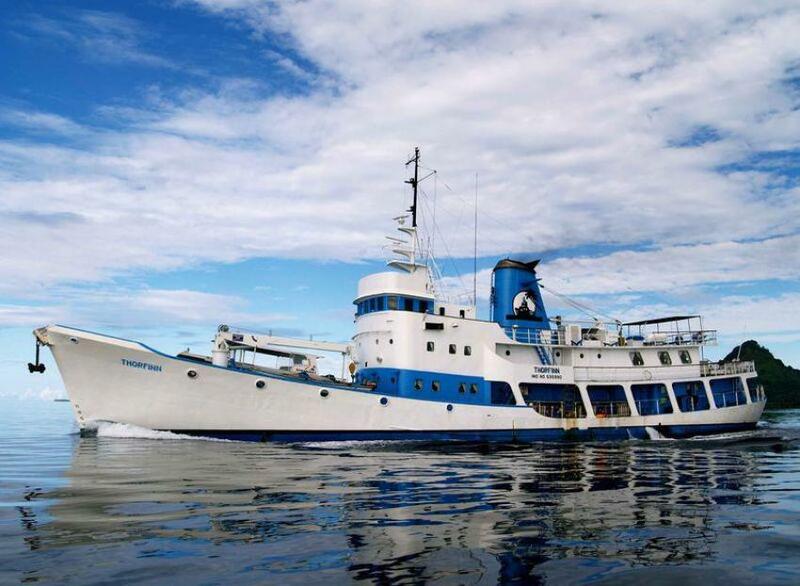 Thorfinn is a liveaboard designed for divers. Boat offers diving in Truk Lagoon, one of the world’s greatest destination for those who likes to dive at wrecks. Thorfinn can accommodate 22 guests in 20 cabins. All cabins have air conditioning, equipped with TV’s and DVD. 5 rooms with double and a single bed located on the lower deck. You can share it with another diver on board or book an entire room. There is one cabin on the main deck with double bed. It’s bigger in size than the other cabin and has monitor and player. These cabins are with private showers. Upper deck cabins have shared facilities. 2 of them equipped with double bed and a single upper bed and one has twin beds. Thorfinn liveaboard has a big lounge area with an entertaining system and bar. Passengers on board can comfortably relax in between dives, watch a TV, read a book from boat’s library. The bar that provides a range of beverages. In addition, a boat has a spacious dining area, where you can taste a variety of delicious dishes, created by boat’s chef. This area can be also used to work with photos in between meals serving. Boat’s open air areas have plenty facilities to relax. Passengers of Thorfinn can enjoy the view on the shaded sun deck. There are some cushioned sun loungers here. For more relaxation boats guests can use the hot tub at the spa deck with ocean water system. Thorfinn dive deck equipped with all necessary items to make your preparation for diving comfortable. There are several sitting areas and storage system for the gear. Special facilities for gas blending would be useful for tech divers. After the dive, passengers can rinse equipment and use fresh water showers. Thorfinn also provides rebreather facilities. There are all safety equipment on board of Thorfinn: life vests and emergency rafts, oxygen and first aid kit, fire fighting equipment. Boats team trained to manage emergency situations. Thorfinn supports technical diving with special dispatches and plentiful systems to serve most all desires, and a large Oxy plant aboard providing breathing gas blends to any desire or portion. Thorfinn liveaboard suits for photo trips. Divers in fond of underwater photography can use camera table with 110V and 220V charging points. There are special storage facilities and equipment to maintain cameras after diving: a compressed air gun to clean photo equipment and separate rinsing tanks. ll rooms on board of Thorfinn have a Tv, where you can watch images made by day, also TV in the lounge area can be used. Thorfinn itinerary dedicated to exploring wrecks of Truk Lagoon. This is a truly unique destination for diving. Truk was considered as the most formidable Japanese fortress. Patrol boats, torpedo boats, submarines, tugs, landing craft, gunboats were defending this base. In 1944 it was destroyed by US army.Over 70 shipwrecks, 400 aircrafts were sunk. Jacques Cousteau was the first who discovered this destination for divers. Truk lagoon is one of the most suitable places for wreck diving. Thanks to tropical conditions, water is calm almost all the time. There are dive sites for divers of all levels. Ships that lie on the shallow depth suits for novices. Advanced divers or divers with tech certification can explore wrecks that lie deeper. Diving at Truk Lagoon is possible all year round. Water temperature is about 29-30’C/84-86’F. From January to April because of the winds water can be a little bit cooler. Although it is calm almost all the time and visibility is good.